A total of 150 staffs of Awash Wine SC has took part at the 17th edition of the 2017 TOTAL Great Ethiopian Run (GER) 10km International mass race which was held on November 26, 2017. The staffs were gathered early in morning before race kicked off and to have a group pictures and videos holding company flag in showing their unity and love. “I would like to say a huge thank you to the company who gave us this opportunity to take in such mass race with my fellow staffs,” said one of the employees. Adding that, “Running together with fellow staff, besides bringing joy and happiness it will help us to develop our team spirit and strength our companionship”. 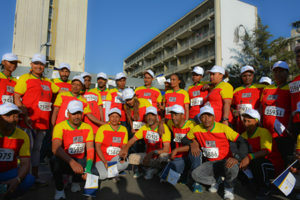 Every year large numbers of Awash Wine SC staffs takes part in the Great Ethiopian Run, the largest mass race in Africa.